[S988] Pauline Randel Walters, comp., Deaths in Southeastern Part of Montgomery County, Indiana with a Few from All Over the County (n.p. : n.pub. 1971), p. 143 (not giving the date or place but stating that she was seventy-nine years old when she died on 8 Aug 1897). [S988] Pauline Randel Walters, comp., Deaths in Southeastern Part of Montgomery County, Indiana, above, p. 143 (stating that her first husband was "? Lockridge"). [S987] Frances Haynes Quinn, comp., Obituary Dates and Your Family Ties: Over 140 Years in Montgomery County, Indiana (Cottage Grove, Ore.: Cottage Grove Gen. Soc'y 1987), p. 121 (identifying her as third wife of Andrew Loop and widow of James Lockridge). [S351] Mabel Shanklin, comp., Montgomery County, Indiana Will (1868-1883) and Marriage (1847-1852) Records, vol. 3 (Danville, Ill.: Heritage House, n.d.), p. 9 (giving her name as Lydia Lockbridge and citing Montgomery County Marriage Record Book III, p. 423). [S985] Robert E. Selby and Phyllis J. Selby, comps., Montgomery County, Indiana Marriage Records 1823-1852 (Kokomo, Ind. : Selby Pub. & Printing 1981), p. 39 (giving her name as Lydia Lockbridge [sic]). [S988] Pauline Randel Walters, comp., Deaths in Southeastern Part of Montgomery County, Indiana, above, p. 143 (not giving the date or place). [S987] Frances Haynes Quinn, comp., Obituary Dates and Your Family Ties: Over 140 Years in Montgomery County, Indiana, above, p. 121 (giving her name as Lydia Wheat Lockeridge and not giving the date or place). [S988] Pauline Randel Walters, comp., Deaths in Southeastern Part of Montgomery County, Indiana, above, p. 143. [S988] Pauline Randel Walters, comp., Deaths in Southeastern Part of Montgomery County, Indiana, above, p. 133 (naming Lydia Wheat as his mother). [S987] Frances Haynes Quinn, comp., Obituary Dates and Your Family Ties: Over 140 Years in Montgomery County, Indiana, above, p. 121 (naming Lydia Wheat as his mother). [S987] Frances Haynes Quinn, comp., Obituary Dates and Your Family Ties: Over 140 Years in Montgomery County, Indiana, above, p. 121 (naming Lydia Wheat as her mother). [S987] Frances Haynes Quinn, comp., Obituary Dates and Your Family Ties: Over 140 Years in Montgomery County, Indiana, above, p. 18 (naming Lydia Wheat as her mother). [S988] Pauline Randel Walters, comp., Deaths in Southeastern Part of Montgomery County, Indiana with a Few from All Over the County (n.p. : n.pub. 1971), p. 143 (stating that her first husband was "? Lockridge"). [S16] History of Montgomery County, Indiana, with Personal Sketches of Representative Citizens (Indianapolis, Ind. : A. W. Bowen, 1913), pp. 720-23. [S988] Pauline Randel Walters, comp., Deaths in Southeastern Part of Montgomery County, Indiana with a Few from All Over the County (n.p. : n.pub. 1971), p. 133 (naming Andrew Loop as his father). [S987] Frances Haynes Quinn, comp., Obituary Dates and Your Family Ties: Over 140 Years in Montgomery County, Indiana (Cottage Grove, Ore.: Cottage Grove Gen. Soc'y 1987), p. 121 (naming Andrew Loop as his father). [S1560] H. W. Beckwith, History of Montgomery County (Chicago, Ill.: H. H. Hill & N. Iddlings, 1881), s.v. "Andrew Loop," pp.393-94, online at bottom of http://rabgenealogy.com/ui217.htm (naming Andrew Loop as his father). [S988] Pauline Randel Walters, comp., Deaths in Southeastern Part of Montgomery County, Indiana, above, p. 133 (not giving the date or naming the place but stating that he was ninety-one years old when he died on 13 Apr 1946). [S987] Frances Haynes Quinn, comp., Obituary Dates and Your Family Ties: Over 140 Years in Montgomery County, Indiana, above, pp. 48, 121 (not giving the date). [S988] Pauline Randel Walters, comp., Deaths in Southeastern Part of Montgomery County, Indiana, above, p. 133 (not giving the date). [S988] Pauline Randel Walters, comp., Deaths in Southeastern Part of Montgomery County, Indiana, above, p. 133. [S989] Genealogy Section of the Montgomery Co. Hist. Soc'y, comp., Family Histories, Montgomery County, Indiana, 1823-1988 (Paducah, Ky.: Turner Pub. Col ca. 1989), p. 352. [S987] Frances Haynes Quinn, comp., Obituary Dates and Your Family Ties: Over 140 Years in Montgomery County, Indiana, above, p. 121 (naming William C. Loop as his father). [S987] Frances Haynes Quinn, comp., Obituary Dates and Your Family Ties: Over 140 Years in Montgomery County, Indiana, above, p. 121 (naming William C. Loop as her father). [S987] Frances Haynes Quinn, comp., Obituary Dates and Your Family Ties: Over 140 Years in Montgomery County, Indiana, above, p. 121 (giving her name as Esther and naming William C. Loop as her father). [S988] Pauline Randel Walters, comp., Deaths in Southeastern Part of Montgomery County, Indiana, above, p. 140 (naming William Loop as his father). [S988] Pauline Randel Walters, comp., Deaths in Southeastern Part of Montgomery County, Indiana, above, p. 143 (naming William Loop as her father). [S16] History of Montgomery County, Indiana, with Personal Sketches of Representative Citizens (Indianapolis, Ind. : A. W. Bowen, 1913), p. 722. [S987] Frances Haynes Quinn, comp., Obituary Dates and Your Family Ties: Over 140 Years in Montgomery County, Indiana (Cottage Grove, Ore.: Cottage Grove Gen. Soc'y 1987), p. 121 (naming Christopher Dice as her father). [S987] Frances Haynes Quinn, comp., Obituary Dates and Your Family Ties: Over 140 Years in Montgomery County, Indiana, above, p. 121 (naming Jane Brocie as her mother). [S988] Pauline Randel Walters, comp., Deaths in Southeastern Part of Montgomery County, Indiana with a Few from All Over the County (n.p. : n.pub. 1971), p. 133 (not giving the date). [S987] Frances Haynes Quinn, comp., Obituary Dates and Your Family Ties: Over 140 Years in Montgomery County, Indiana, above, p. 121. [S987] Frances Haynes Quinn, comp., Obituary Dates and Your Family Ties: Over 140 Years in Montgomery County, Indiana, above, p. 121 (naming Euphemia Dice as his mother). [S987] Frances Haynes Quinn, comp., Obituary Dates and Your Family Ties: Over 140 Years in Montgomery County, Indiana, above, p. 121 (naming Euphemia Dice as her mother). [S987] Frances Haynes Quinn, comp., Obituary Dates and Your Family Ties: Over 140 Years in Montgomery County, Indiana, above, p. 121 (giving her name as Esther and naming Euphemia Dice as her mother). [S988] Pauline Randel Walters, comp., Deaths in Southeastern Part of Montgomery County, Indiana, above, p. 140 (naming Euphemia Dice as his mother). [S988] Pauline Randel Walters, comp., Deaths in Southeastern Part of Montgomery County, Indiana, above, p. 143 (naming Euphemia Dice as her mother). Note*: He was one of the oldest settlers of Montgomery County, Indiana, and was from Virginia. [S988] Pauline Randel Walters, comp., Deaths in Southeastern Part of Montgomery County, Indiana with a Few from All Over the County (n.p. : n.pub. 1971), p. 67 (not giving the date but stating that he was seventy-eight years old when he died in Sep 1906). [S987] Frances Haynes Quinn, comp., Obituary Dates and Your Family Ties: Over 140 Years in Montgomery County, Indiana (Cottage Grove, Ore.: Cottage Grove Gen. Soc'y 1987), p. 48. [S988] Pauline Randel Walters, comp., Deaths in Southeastern Part of Montgomery County, Indiana, above, p. 67 (not giving the date). [S987] Frances Haynes Quinn, comp., Obituary Dates and Your Family Ties: Over 140 Years in Montgomery County, Indiana, above, p. 48 (giving the date but not naming the place). [S988] Pauline Randel Walters, comp., Deaths in Southeastern Part of Montgomery County, Indiana, above, p. 67. [S987] Frances Haynes Quinn, comp., Obituary Dates and Your Family Ties: Over 140 Years in Montgomery County, Indiana, above, p. 48 (naming Christopher Dice as her father). [S987] Frances Haynes Quinn, comp., Obituary Dates and Your Family Ties: Over 140 Years in Montgomery County, Indiana, above, p. 121 (naming Christopher Dice as her father). [S987] Frances Haynes Quinn, comp., Obituary Dates and Your Family Ties: Over 140 Years in Montgomery County, Indiana, above, p. 48 (naming Christopher Dice as his father). [S988] Pauline Randel Walters, comp., Deaths in Southeastern Part of Montgomery County, Indiana with a Few from All Over the County (n.p. : n.pub. 1971), p. 67. [S987] Frances Haynes Quinn, comp., Obituary Dates and Your Family Ties: Over 140 Years in Montgomery County, Indiana, above, p. 48 (naming Jane Brockman as her mother). Clyde Dice Loop's tombstone, Mace Cemetery, Mace, Ind., by R & S Fine. Birth*: He was born on 17 October 1878. [S16] History of Montgomery County, Indiana, with Personal Sketches of Representative Citizens (Indianapolis, Ind. : A. W. Bowen, 1913), pp. 722-23. [S988] Pauline Randel Walters, comp., Deaths in Southeastern Part of Montgomery County, Indiana with a Few from All Over the County (n.p. : n.pub. 1971), p. 140 (naming William Loop as his father). [S987] Frances Haynes Quinn, comp., Obituary Dates and Your Family Ties: Over 140 Years in Montgomery County, Indiana (Cottage Grove, Ore.: Cottage Grove Gen. Soc'y 1987), p. 121 (naming William C. Loop as his father). [S988] Pauline Randel Walters, comp., Deaths in Southeastern Part of Montgomery County, Indiana, above, p. 140 (not giving the date). [S988] Pauline Randel Walters, comp., Deaths in Southeastern Part of Montgomery County, Indiana, above, p. 140. [S961] Find A Grave, online at http://www.findagrave.com, memorial for Clyde Dice Loop, memorial no. 36607070, viewed on 10 Jul 2011 (giving the year but no other information). [S961] Find A Grave, online, above, memorial for Clyde Dice Loop, memorial no. 36607070, viewed on 10 Jul 2011. [S988] Pauline Randel Walters, comp., Deaths in Southeastern Part of Montgomery County, Indiana, above, p. 140 (stating that he and Sallie died in an automobile accident). 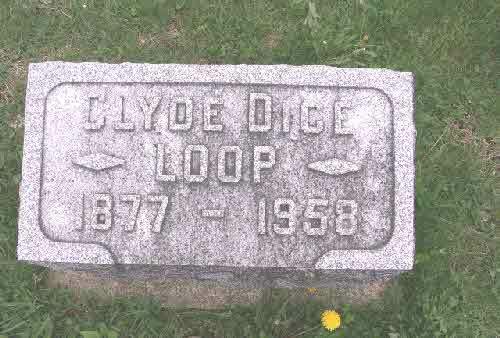 [S961] Find A Grave, online, above, memorial for Clyde Dice Loop, memorial no. 36607070, viewed on 10 Jul 2011 (stating that he was born in 1877). [S988] Pauline Randel Walters, comp., Deaths in Southeastern Part of Montgomery County, Indiana with a Few from All Over the County (n.p. : n.pub. 1971), p. 140 (not giving the date). [S988] Pauline Randel Walters, comp., Deaths in Southeastern Part of Montgomery County, Indiana with a Few from All Over the County (n.p. : n.pub. 1971), p. 140. [S987] Frances Haynes Quinn, comp., Obituary Dates and Your Family Ties: Over 140 Years in Montgomery County, Indiana (Cottage Grove, Ore.: Cottage Grove Gen. Soc'y 1987), p. 61. Marriage*: He married Ethel Conn. Note*: He was a special agent for Ohio Farmers Insurance Company. They lived in Warsaw, Indiana. Marriage*: She married Ernest A. Loop, son of William C. Loop and Euphemia Dice. [S987] Frances Haynes Quinn, comp., Obituary Dates and Your Family Ties: Over 140 Years in Montgomery County, Indiana (Cottage Grove, Ore.: Cottage Grove Gen. Soc'y 1987), p. 121 (naming William C. Loop as her father). Ethel V. Loop's tombstone, Mace Cemetery, Mace, Ind., by R & S Fine. [S988] Pauline Randel Walters, comp., Deaths in Southeastern Part of Montgomery County, Indiana with a Few from All Over the County (n.p. : n.pub. 1971), p. 143 (naming William Loop as her father). [S988] Pauline Randel Walters, comp., Deaths in Southeastern Part of Montgomery County, Indiana, above, p. 143 (not giving the date or place but stating that she was fourteen years old when she died on 24 May 1899). 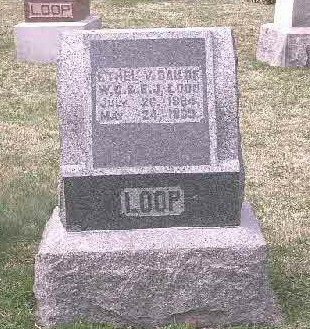 [S961] Find A Grave, online at http://www.findagrave.com, memorial for Ethel V. Loop Loop, memorial no. 35720763, viewed on 10 Jul 2011. [S961] Find A Grave, online, above, memorial for Ethel V. Loop Loop, memorial no. 35720763, viewed on 10 Jul 2011 (giving the date but no other information). Marriage*: She married Wallace McNulty. Death*: She died before 1913. Marriage*: He married Ruth J. Loop, daughter of William C. Loop and Euphemia Dice. Note*: He was a farmer in Walnut Township, Montgomery County, Indiana. His surname may have been McAnulty. [S16] History of Montgomery County, Indiana, with Personal Sketches of Representative Citizens (Indianapolis, Ind. : A. W. Bowen, 1913), p. 723. Note*: She and her husband reside at Mace, Indiana and operate Nicholode Ceramic Studio. [S987] Frances Haynes Quinn, comp., Obituary Dates and Your Family Ties: Over 140 Years in Montgomery County, Indiana (Cottage Grove, Ore.: Cottage Grove Gen. Soc'y 1987), p. 121 (giving her name as Esther and naming William C. Loop as her father). [S987] Frances Haynes Quinn, comp., Obituary Dates and Your Family Ties: Over 140 Years in Montgomery County, Indiana, above, p. 48 (giving her name as Esther). [S987] Frances Haynes Quinn, comp., Obituary Dates and Your Family Ties: Over 140 Years in Montgomery County, Indiana (Cottage Grove, Ore.: Cottage Grove Gen. Soc'y 1987), p. 48 (giving her name as Esther). Birth*: She was born on 17 January 1855. Other Names*: Virginia Loop Stafford, Virginia Stafford. Note*: She and William were twins. [S987] Frances Haynes Quinn, comp., Obituary Dates and Your Family Ties: Over 140 Years in Montgomery County, Indiana (Cottage Grove, Ore.: Cottage Grove Gen. Soc'y 1987), p. 121 (naming Andrew Loop as her father). [S1560] H. W. Beckwith, History of Montgomery County (Chicago, Ill.: H. H. Hill & N. Iddlings, 1881), s.v. "Andrew Loop," pp.393-94, online at bottom of http://rabgenealogy.com/ui217.htm (naming Andrew Loop as her father). [S987] Frances Haynes Quinn, comp., Obituary Dates and Your Family Ties: Over 140 Years in Montgomery County, Indiana, above, p. 177 (giving his name as William G. Stafford). Note*: He farmed in Union Township, Montgomery County, Indiana. [S987] Frances Haynes Quinn, comp., Obituary Dates and Your Family Ties: Over 140 Years in Montgomery County, Indiana (Cottage Grove, Ore.: Cottage Grove Gen. Soc'y 1987), p. 177 (giving his name as William G. Stafford and naming George Stafford as his father). [S987] Frances Haynes Quinn, comp., Obituary Dates and Your Family Ties: Over 140 Years in Montgomery County, Indiana, above, p. 177 (giving his name as William G. Stafford and naming Rachel Stitt as his mother).